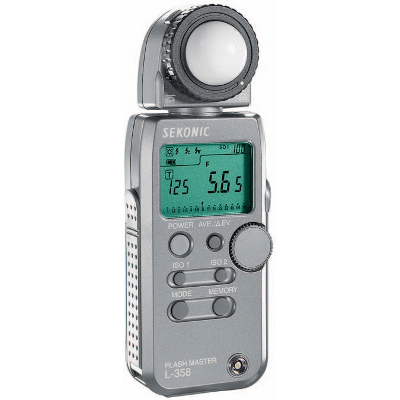 The Sekonic L-358 displays an f-stop range of f/1.0 to f/90.9, and a shutter speed range of 30-minutes to 1/8000th-of-a-second (1/1000th in Flash mode), both of which can be displayed in full-, half-, and third-stop intervals to mirror your camera’s exposure display. When set to “full,” the exposure is displayed in tenth-of-a-stop increments with repeat accuracy of +/- 0.1 EV. For motion picture applications, the L-358 calculates cine readings from 2 to 360 frames-per-second.